Kenneth Winston, style 1724: Fabric: Beaded Embroidery Pattern on English Net, Organza and Satin. The staff at New York Bride & Groom is swooning over the wedding dresses in Kenneth Winston’s 2017 Spring Collection. Beautiful lace, luxurious fabrics and stunning silhouettes are the hallmarks of this exquisite assemblage from Kenneth Winston, the main line from the Private Label by G design house. Kenneth Winston has been delivering exceptional wedding gowns for over three decades and their latest collection — which includes our featured dress, style 1724 — proves they aren’t resting on their laurels. Inspired designs, popular pricing, and no appointment needed: It’s no wonder why NYB&G is considered the best bridal salon in the Triangle. 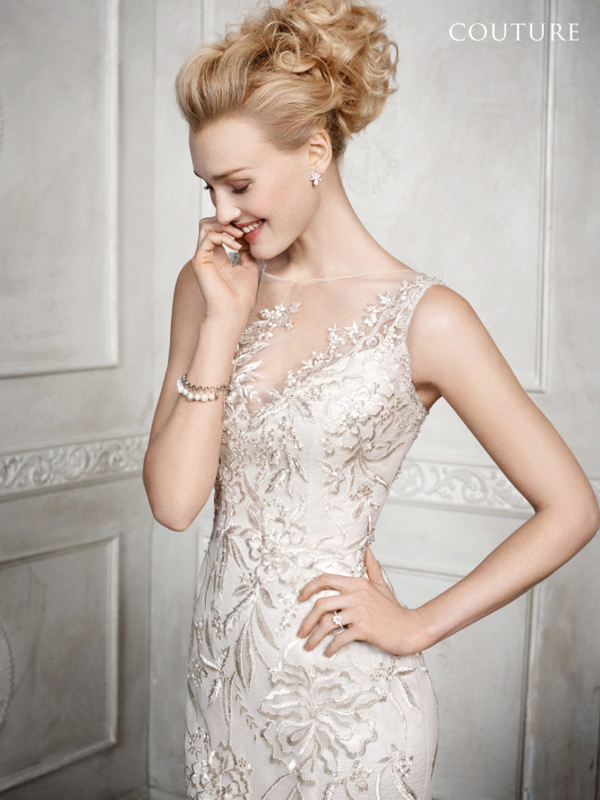 Whether your vision for your wedding dress is simple and sweet or detailed to the max, we’ve got you covered. Carrying the hottest bridal designer lines in our modern luxury boutique ensures that you have the season’s best choices in one location. Kenneth Winston is just one of the amazingly talented wedding dress designers who have launched their 2017 Spring Collections. Come and see all of our varied options today. We know your dream dress is here waiting for you and we can’t wait to help you find it. We look forward to seeing you and your bridal entourage soon. Kenneth Winston, style 1718: Fabric: Beaded Embroidery on English Net, Satin. A large part of what makes New York Bride & Groom the premier full-service bridal salon in Raleigh and beyond is our unbeatable service. For instance, we invite you to take photographs or FaceTime and Skype with your out-of-town family and friends while you try on dresses. Once you’re all squared away, head over to our bridesmaids department and help your best ladies find their dresses as well. You don’t even have to leave the men at home when you’re shopping at NYB&G. Our separate tuxedo department means the guys can shop for their designer rentals without spoiling the wedding dress reveal on the big day. Imagine the extra time you will have to take care of your wedding details when all the garments are finalized in a single visit. At New York Bride & Groom, we make it possible.